In the spirit of following the precession of equinoxes I’ll provide a two course crocodile dinners: next week, another set of “gleanings” will follow this one. Different opinions about the etymology of strawberry crowd out one another on the Internet. A page from my book Word Origins is also there, and I could (cou’d) have confined myself to a brief reference to Google, but I have something new to say in addition to what appears there and will therefore devote some space to the delicious berry. The double trouble with strawberry is that no other European language has a similar name (one late occurrence in Swedish is of unknown provenance) and that, on the face of it, straw– makes little sense in it. The word goes back to Old English, and there must have been a serious reason for coining it or for changing the traditional denomination (that is, “earth-berry,” which did turn up at that time but, judging by the extant texts, was known very little). One thing is clear: the Germanic invaders of Great Britain did not bring the word strawberry to their new homeland from the continent. A change reminiscent of the one known from the history of English also occurred in Swedish. Only in that Scandinavian language “earth–berry” was replaced with the obscure name smultron, a regional word, as it seems. The change occurred some time before the beginning of the fifteenth century. Several conjectures about the origin of smultron exist, but none is fully persuasive. I am sure heavy thoughts about etymology never bothered Ingmar Bergman, the producer of Smultronstället, known in English as Wild Strawberries (stället means “the place”). Absolutely delicious and no straws attached. If we disregard Friedrich Kluge’s idea, which is wilder than wild strawberries, that straw– is related to Latin fragola “strawberry,” we will be left with trying to find out what straw has or had to do with this berry. (The editors of the OED knew the fragola idea and politely rejected it—politely, because scholars of Kluge’s stature have to be treated with deference.) The first element of the English word may have been strew rather than straw, with reference to the propagation by runners; Skeat found this explanation not improbable. Yet it is unlikely that the first element of the name in question was a verb. If straw was ever used in protecting strawberries, this practice would have been important only in gardening, but before naming the garden berry, whose cultivation is late, people gathered strawberries in the wild. Then there are straw-like particles (achenes) that cover the surface of this berry. So straw-like berry? This etymology is hesitatingly favored by the OED. Strawberries are often stringed, that is, collected and threaded on thin straws, another vague clue. 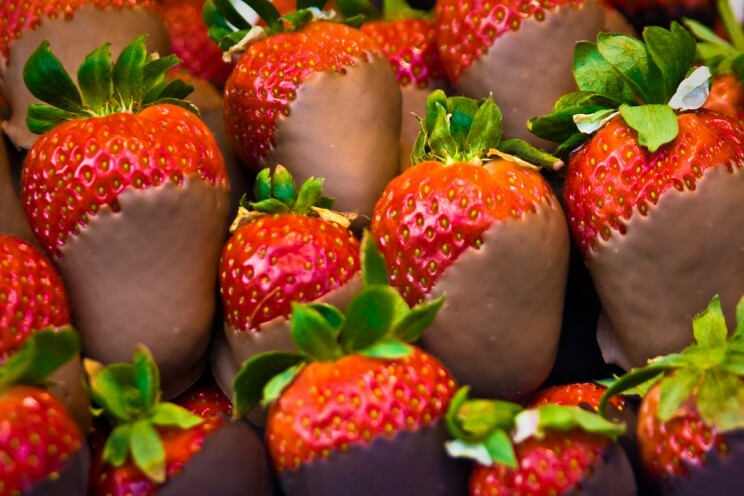 It has also been suggested that strawberry is an alternation of strayberry. But what is strayberry? Folk etymology produces transparent words, not new riddles. According to the simplest guess known to me, strawberries often grow in grassy places and hayfields. A tiny piece of evidence in support of this hypothesis is the fact that Swedish smultron first occurred in the compound smultronagræs around the year 1400. There is one thing that bothers me. If strawberry means approximately “earth-berry,” why did people go to the trouble of calling it something else, seeing that the most natural name (earth-berry) was available and widely known? So here we are: a delicious fruit and a troublesome word. I don’t think there is a problem. 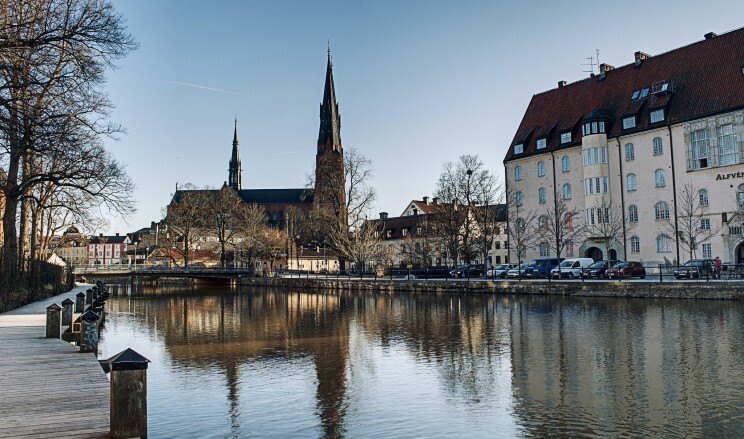 The earliest Uppsala, first mentioned in historical documents in the tenth century, was known to the skalds, who used the name in the plural (Uppsalir). Uppsala turns up in so-called legendary sagas. The place designated a town or a group of houses “up there,” as opposed to an older place called Sala. Image credits: (1) Chocolate-Coated Strawberries. Photo by Garry Knight. CC BY 2.0 via garryknight Flickr. (2) Cold spring day in Uppsala, Sweden. Photo by Alexander Cahlenstein. CC BY 2.0 via tusken91 Flickr. As in case with tulips and the best Dutch gardeners, this lets think of the process of cultivation or domestification of „earth-berries”. In Latvian the diference there is between forest and garden earthberries (meža vs dārza zemenes), the fruit of the latter being larger and more fit for the market. Looking up for French word fraise and its multiple homonyms which confluenced into one word is really exciting. Just to think how a neck ruff, medieval defence of a rampart of pointed stakles, cutting tool and strawberries could be related. In addition, influence of framboise on development of fraise leaves traces to Germanic *brambasi – Brombeere with some br/fr (and possible str) transformations. In cultivation of strawberries it is very important to cut spreading runners or strings (stīgas in Latvian) to let the main plant to grow. But why aren’t they called stringberries then? Thia is really a thought-provoking. Why the sneery sic at Kipling’s perfectly correct Precession? Did you think he’d mis-spelled ‘procession’ ? It’s the westward movement of the Earth’s axis as seen from the Northern hemisphere. It should be kept in mind that garden strawberries (as opposed to woodland, or “wild” strawberries) are not native to Europe. They are a new-world import, like potatoes, pumpkins, and tomatoes. So European languages had the option of calling them by the same name as the wild strawberries they knew, or inventing a new name. In Persian, since they were introduced from the west, strawberries are called tut-farangi, i.e. European (literally “Frankish”) mulberries. This blog post has 2014 in the title rather than 2015. Thank you Stephen! I’ve fixed it. Not sure how Anatoly and I missed that. You might have asked a gardener. The berries grow beneath the leaves of the plant, and need to be munched to prevent them rotting through contact with wet soil. An ideal mulch, cheap and available, with no seeds in it to sprout weeds: straw. Oops. I meant need to be mulched…my tablet auto corrected me, sorry. If you insert the straw form the bottom up, it pops the green bit off the top. So you have a neat way of carrying them around and they’re ready to eat. I’ve see wild strawberries growing. They are are lie tangled mess. Much like straw with tiny red berries growing amongst them. Kind of like finding tiny, delicious, tart needles amongst the tangle. Makes perfect sense to me. I heard strawberries are so-called because of a tradition of spreading them out on straw after they had been picked. “difficult”, “tough”, “hard” (svår in Swedish). I think the origin of the word “strawberry” has a rather simple explanation. In Scandinavia kids used to pick wild strawberries and thread them on a straw for transportation. I’m guessing kids in England used to do the same. It is very traditional here in Finland to pick the small wild strawberries and punch a straw through them. The straw can then be carried in hand while walking and strawberries pulled from it with teeth one by one. Makes a walk through the forest pleasant and sweet. The Finnish word for strawberry is mansikka though, and it doesn’t have any connection with a straw. But perhaps a similar tradition could have existed elsewhere too? On “ish var da”…. yes “uff da” was a common midwestern US phrase 50 years ago. my grandmother of swedish/minnesotan farm descent would use “ish da” with her grandson clearly implying “that’s nasty” and usually when such nasty things were near ears, eyes, nose or mouth. As a Scandinavian I learnt already as a child to thread strawberries onto a straw. Hence the word strawberry most likely comes from this ancient habit. Is it worth investigating the timing of the name change with changes in animal husbandry. It seems to coincide with feeding animals with a winter crop indoors. Since they prefer well draining highly fertile soils, the wild varieties might have sprouted in the straw from byres.